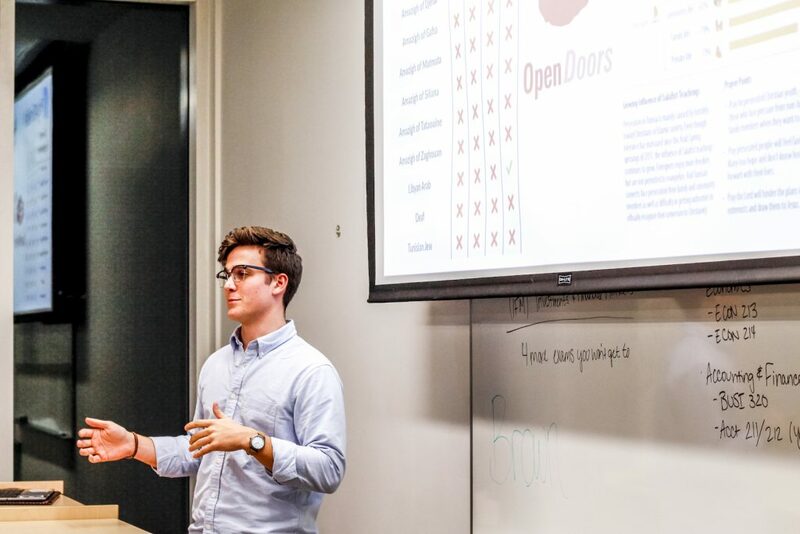 Project Fourteen 22 continues to bring awareness about the 215 million persecuted Christians in the world by hosting meetings and events that encourage students to stand up for mistreated Christians across the globe. Tuesday, Jan. 29 marked the first meeting of the semester for Project Fourteen 22. Evan Gaul, president of the club, opened the meeting by discussing current events around the world where Christians are being attacked, such as the recent attack on a Roman Catholic cathedral in the Philippines by an Islamic extremist group, resulting in 20 deaths. The group’s communications director, Jonathan Brown, spent 14 years of his life living in Tunisia where his father served as a missionary. Brown runs the group’s Instagram account and designs posters to inform students about upcoming meetings. This semester, Project Fourteen 22 will no longer have biweekly meetings but will announce via social media the time and location of future meetings. Gaul believes that word of mouth and social media are the best ways for students to stay up to date on when the group is gathering next. “Coming to the meetings is the … most basic way to be involved, and (the) least time consuming,” Gaul said. CLUB — Evan Gaul founded Project Fourteen22 in fall of 2018. Since the creation of Project Fourteen 22, Gaul said that around 80 students have come to the meetings and engaged in prayer for persecuted Christians. Gaul encourages students who are part of the group to submerge themselves in the culture of the persecuted church, along with researching churches and organizations actively aiding persecuted people. “Try to reach people at Liberty (who) you know are international students … from hostile countries,” Gaul said. Project Fourteen 22 sends out a weekly newsletter about current events happening around the world involving persecuted Christians and how other Christians can pray for them. The next meeting will be held Feb. 12 during Global Focus week. More details about the meeting will be posted on Project Fourteen 22’s social media, @projectfourteen22 on Instagram.